It is a sure sign that spring is in the air: The sight of a bumblebee queen buzzing around spring flowers on a sunny day. But sometimes, when she is flying around, she is actually not looking for flowers, but on the hunt for a good place to build a nest. The bumblebee queen is looking for a dark hole in the ground. When she finds one that smells of mice, she knows she has succeeded. She mates in autumn and spends the winter in a safe place, for instance an abandoned mouse hole, a woodpile, a compost heap, or thick grass. In spring, she establishes her own family in an abandoned mouse nest. Mouse holes are well-insulated and especially appealing for bees looking to establish a new colony. Mice collect grass, hair, and moss to insulate their nests, which bumblebees could not do themselves. Our research shows that a well-insulated nest is crucial for the queen and subsequently, her large family, to retain heat and stay warm. There should also be nectar close by in spring, so that the queen does not have to leave the eggs for long periods. The longer she spends incubating eggs the more adult bees hatch. When the queen finds a suitable mouse nest, she builds some wax cells, which she fills with honey, and then lays her first four to five eggs in a small lump of wax. Bumblebee eggs and larvae develop much faster at warmer temperatures. So in the early Scandinavian spring, where the soil is cold, the queen needs to take drastic action. The queen sits on top of the wax lump with the eggs and vibrates, using her flight muscles to generate heat. By doing this she can increase the temperature by 15 degrees centigrade. It requires energy to keep warm, and this energy comes from the nectar that the bumblebee queen has laboriously collected and stored in the honey cells. If she hasn't collected enough, she must head out to collect more. But when she leaves, the temperature around the eggs drops dramatically and their development stalls until she returns. If the nest is surrounded by a garden full of flowers, then it is not so bad, as she can quickly return to her nest to care for her young. But finding enough nectar can take much longer in a field with few flowers. In the laboratories at Aarhus University, we placed tiny thermometers in the wax lump that contained the eggs. And the results are clear: Eggs hatch quicker when the queen devotes more time to incubating her eggs. The first worker bees hatch in May. All of them are females and they make the queen's job much easier. Initially, she works completely alone. She collects the nectar herself and incubates the eggs. But the workers help share the work load. Not only do they help collect food and incubate the eggs, but they also help to warm up the colony. Our measurements show that bumblebees can heat the colony to a temperature of 32 degrees centigrade, even when it is just 10 degrees outside. The nest starts to break down in mid-summer, and our studies show that the final family size is bigger and contains more new drones and queens, when the bumblebees have more time to incubate eggs in spring. When the queen spends more time looking for nectar instead of incubating eggs during the spring, it takes longer for the first workers to develop and hatch, resulting in a smaller colony later on. We have also used an ecological simulation model to describe how the colony develops during the course of a season. We saw that availability of nearby flowering plants was crucial for the colony to grow big enough to secure the following generation. The model scenarios include numerous combinations of good and bad flowering conditions and various amounts of insulation, as well as a scenario at constant optimal egg temperature and a scenario with no incubation, in which a colony was never established. By summer, the colony has ideally grown to a couple of hundred members. The family now has masses of workers to collect nectar and pollen, and to maintain the optimal temperature. The family takes care of creating the optimal conditions and the queen can now focus on producing offspring, including male worker bees and new queens that will continue the family next summer. In July and August, the newly hatched males and new queens leave the nest. They fly out and mate in order to continue the lineage. The males die afterwards and the queens head out to find a good hideout to wait until next spring. And the old queen: Her mission is now complete. Upon her death the colony dissolves and the remaining bumblebee workers die. We have developed a simulation model that shows the size of the white-tailed bumblebee colony by mid-summer, and the output from this model indicates how many males and new queens the colony will produce. When we compare the results of our temperature measurements with our models, we see that the ability of the queen to pass her genes on depends on the time she devotes to incubating eggs in early spring. And this determines the cumulated number of bumblebees that we can enjoy next summer. 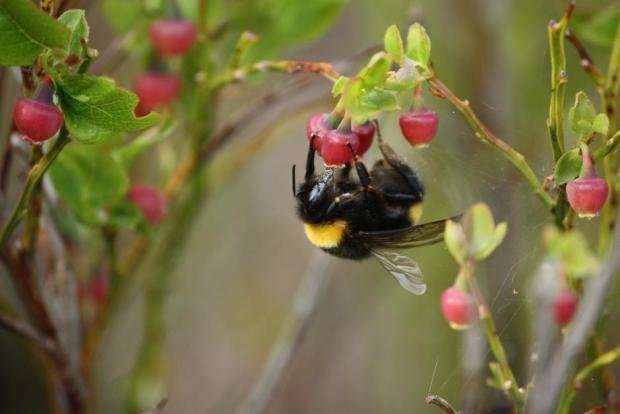 We can help her along by growing lots of flowers in the garden, along roadsides, in fields and along boundaries, so that the bees can incubate eggs as much as possible and do not have to spend such a long time away from the nest. Back to the mouse nest. Why is it so important for the queen bumblebee to find one? It is simply because she needs to stay warm. We insulate our own homes to stay warm when it's cold outside. We use cavity wall insulation, double-glazing, and a thick layer of insulation under the roof. Insulation is particularly important for the lone queen to ensure that the heat she produces does not simply dissipate into the soil but remains in the nest. Our model shows that bumblebees simply cannot survive in Scandinavia without incubation and warming of the nest, which also determines the ultimate size of the colony. A well-insulated nest situated in an area surrounded by flowers is the secret to the bumblebee queen's success.